Earlier this month, Square introduced a new SDK that enables mobile developers to accept credit card payments right in their app. Just like everything Square does, the integration seems very simple and it includes many features to make the payment experience really smooth for users. But… is Square too late to the game? In this flash report we’ll look at the market for payment SDKs and current incumbents. The data for this report is based on SDK analysis of roughly 2 million iOS and Android apps, 70,000 of which have at least one payment SDK installed. With the new SDK, Square is going up against a strong opponent — PayPal. PayPal is installed in nearly 45% of apps that have a payment SDK installed. To make things even worse for Square, Braintree—the second most popular payments SDK with roughly 28% share—is owned by Paypal, giving them a truly commanding lead amongst payment solutions. And in case that wasn’t enough, last year Braintree swallowed Venmo’s payments SDK giving it even more market share. 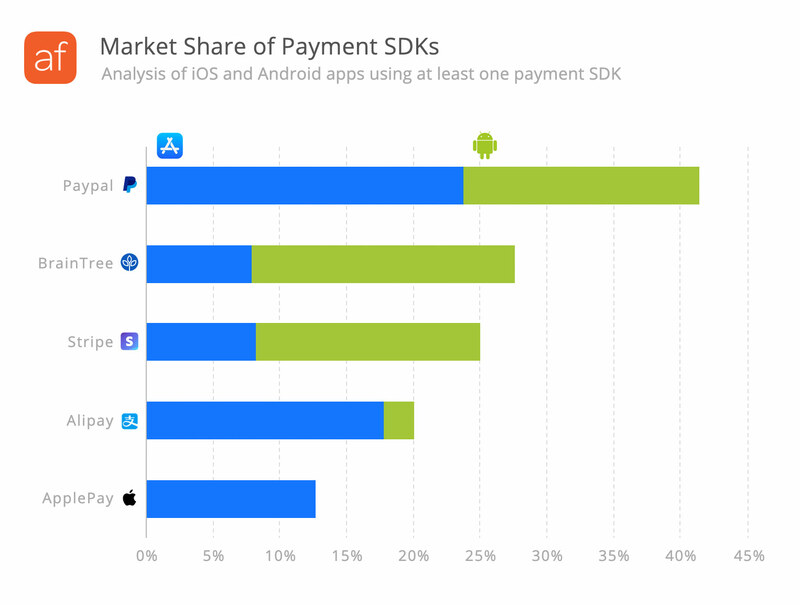 Developer favorite Stripe which ranks third is installed in about 25% of apps, and Alibaba’s payments SDK is currently installed in roughly 20% of apps that use a payment SDK. We included Apple Pay in this report even though its platform-specific because its adoption rate is actually higher than we initially expected, with an install-base of roughly 13%. Unlike its early success with credit card readers, the payment SDK market isn’t as open for a new entrants. Square’s ability to offer much better terms and a smoother payment experience is what could set it apart. FYI: We’re scanning millions of iOS and Android apps every day to find the ones that are installing Squares new SDK, and will report on that in the next few months. Keep an eye on the blog and subscribe to the mailing list to get the report.